Bao is a complex strategy game of Kenya and Zanzibar, played on a 4x8 board. Kalah is the ruleset usually included with commercially available boards; however, the game is heavily biased towards the first player, and it is often considered a children's game. The board is 2x6 with stores. Oware, the national game of Ghana, is also known by Warri, Ayo (Yoruba Name. Nigeria), Awele, Awari, Ouril, and other names. It has relatively simple rules but considerable strategic depth. The board is 2x6 with stores. 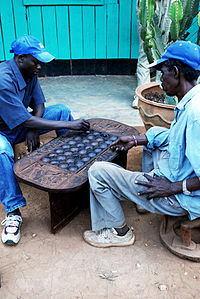 Omweso (also known as coro) is a strategic game of Uganda, played on a 4x8 board. Pallanguzhi is played in Tamil nadu, Southern India with 2 x 7 stores. Two varieties of this game are popular, Kaashi and Bank. Bohnenspiel is a German mancala based on a Persian game not unlike some African mancala variants. The board is 2x6 with stones. Eson xorgol, a game played by the Kazakh minority in western Mongolia, is traditionally played with goat feces. The board is 2x5. //Hus is a Namibian game. The board is 4x8. The Glass Bead Game (Christian Freeling) is a complex mancala-style game with different colored stones. Oh-Wah-Ree is a commercial variant of oware with provision for more than two players. 55Stones is a modern mancala game with simultaneous moves. Kauri is a modern mancala game with two kinds of seeds. Space Walk is a modern boardgame with mancala mechanic. Trajan is a modern boardgame variant with mancala mechanic. Five Tribes is a modern boardgame variant with mancala mechanic. Abangah (the Azande of Sudan) The board is 2x8 with stores. Ba-awa (Ghana) The board is 2x6 with stores. Congkak (Indonesia, Malaysia) The board is 2x7 with stores. Thai Mancala board (possibly Mai Chakot or Mak Khom), as displayed in the Institute of Southern Thai Studies near Songkhla. Photograph of two Thai girls playing with a mancala board, possibly the game Main Chakot or Mak Khom. Melegayası (Turkey) The board is 2x9 with stores. Mereköçdü (Azerbaycan) The board is a circle of six holes. Each player has 21 stones. Pallanguzhi (Tamil of India), also known as Pallankuli. Toguz korgool (Kyrgyzstan) The board is 2x9 with stores.